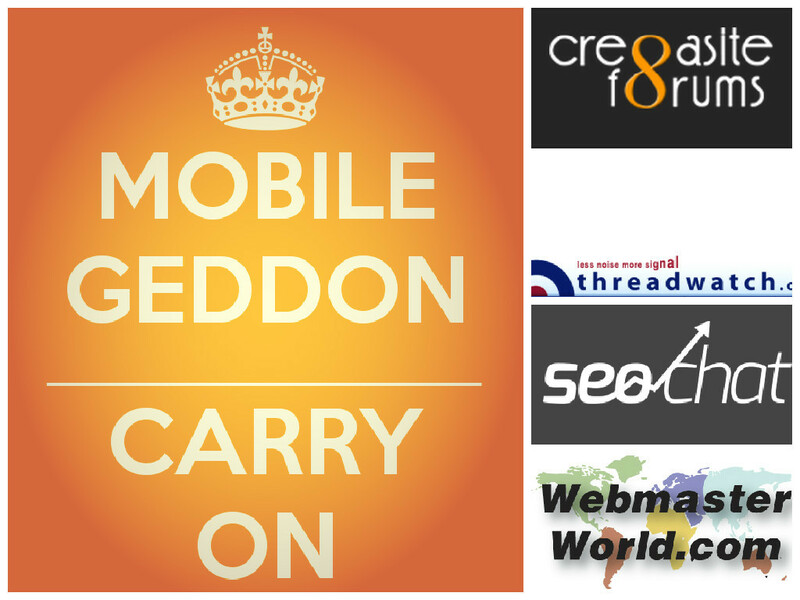 The impending mobile update or “Mobilegeddon” is infiltrating the consciousness of most webmasters, SEOs and our communities with multiple threads on mobile usability popping up across the forums. People are also talking about Google over the recent ranking success of their new product, Google Domains. And while content, linking and even Microsoft get a little attention this week, most of us seem to have our eyes on our smart phones for the foreseeable future. The words “Panda” and “Penguin” put the fear of Google Gods in digital marketers and online business owners everywhere. Or at least they should. That’s why when a member of Google’s Webmaster Trends team, invoked them recently at SMX Munich, the sense of foreboding surrounding “Mobilegeddon” surged even further. Zineb Ait Bahajji, was quoted saying that this update would have a bigger impact and thank Panda and Penguin. Considering how many are still surrounded by the ashes of their websites or reeling from the brutal struggle of getting out from under these updates this comparison is adds signifying gravitas to the weight of this new algorithm change. In a non-Google related piece of news, another tech wonder is beginning to phase out a piece of its history. While Microsoft will technically be keeping Internet Explorer alive for compatibility, Windows 10 will offer a new primary way for users to access the internet. What’s the code name of the new browser in development? Project Spartan. Could we read into the name? Could we surmise that Microsoft is trying to create a “warrior” of a browser? They are currently researching a host of possibilities for the final name. But hopefully the new browser will have more improvements than just a fancy market-tested moniker. But will it be enough? Can a new name help Microsoft become more competitive among the likes of Firefox and Chrome? While Google Domains winning a coveted SERP position could be seen as an entirely self-interested move, could this also be interpreted be a case study for “doing it right”? Is this a testimonial that big brands can expand into new markets and transfer equivalent authority to new products? Or is it possible that maybe Google is just really good at SEO-ing themselves? What do you think? It is not always the same as being truly friendly to mobile users. Setting up a site for mobile usability may require some of the same more “traditional” methods that many websites employed with establishing desktop usability best practice, like user testing or interaction monitoring. Of course if these user experience optimization tactics were never employed on the desktop version of the website, then now is as good a time to consider both! Speaking of Penguin, in another thread a commenter submits a post outlining their proposed process for counteracting the negative impact form the famous flightless bird update. The steps enumerated bring up several complex issues form data reliability to the necessity of link removal vs. disavows alone. Anyone who has ever been through it is welcome to share their words of wisdom and those looking to head down this path, this is a great opportunity to ask questions and get insights. Important: Know a site built with Microsoft Frontpage?